A Walk Among the Tombstones is not Taken. It's not a flashy movie. It's not a provocative movie. It is, in more ways than one, a sober movie. And I think that's fantastic. We have plenty of kinetic action thrillers. Sometimes it seems like there's a new one every damn week. Neeson himself has turned the genre into a cottage industry, with Taken and its abysmal sequels, Non-Stop, The Grey and more. But old-school, pound-the-pavement private-eye thrillers? Now those are a bit more rare these days, and Scott Frank has delivered a hell of a modern day entry to the genre. But while A Walk Among the Tombstones is far more subdued than most, it's still a modern-day Liam Neeson vehicle: Gruff, grim, and unrelentingly masculine. I don't know why, but Liam Neeson seems to want to be the last bastion of an increasingly outdated type of masculinity, and Scott Frank indulges perhaps a bit too much. But whatever problems have plagued Neeson's late-period exploration of old-school machismo, it proves incredibly watchable here. Neeson plays Matthew Scudder. In 1991, NYPD officer Scudder was having a drink when the diner is robbed. The tipsy officer gives chase and shoots down both criminals... and, accidentally, a civilian. Eight years later, Scudder is retired and sober, a dedicated presence at AA barely eking out a living as an unlicensed private eye. That day - the shooting, and his subsequent decision to get sober - informs nearly every action Scudder takes throughout the film, particularly during a fantastic climactic gunfight intercut with and informed by an AA meeting. In A Walk Among the Tombstones, violence always - always - comes at a cost. The plot is fairly similar (albeit superior) to The Girl with the Dragon Tattoo: A disgraced investigator is hired to look into a missing woman who is, it turns out, linked to a series of brutal murders perpetrated by a pair of men. Writer/director Scott Frank lacks David Fincher's sense of style, but I actually think that this is a good thing. Fincher's style can sometimes overwhelm the tone of the film, and A Walk Among the Tombstones wouldn't survive that level of tonal incoherence. Its greatest strength is its single-minded commitment to the idea of sobriety, an idea that permeates through the performances and into the world itself. 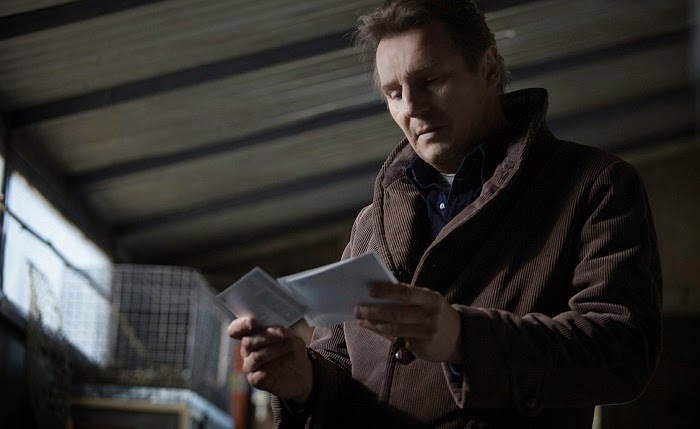 But while A Walk Among the Tombstones frequently resembles The Girl With the Dragon Tattoo stripped of its excess, its creative sensibilities owe more to another Fincher film: Seven, albeit a version of that film with perhaps a touch of Soderbergh's subtlety to keep things level. Like Seven (or, sigh, Se7en), Frank Scott's take on the city borders on apocalyptic, a bleak cultural wasteland whose real predators are overlooked or misunderstood by people who, in the words of the film, "fear all the wrong things." The crimes against women are as horrific as John Doe's, but mostly subtly portrayed - the film's weakest moments find Scott showing rather than suggesting, perhaps in order to raise the stakes or perhaps just so that there can be any speaking parts for a woman in the film. A Walk Among the Tombstones is a punishing movie, a trip into the grim past of New York City and a hard life of penitence and sobriety. To some, that reads as slow, as boring. And to many more, myself included, the film's treatment of women is a whole other kind of punishing, an almost overwhelming push of sexualized violence and objectification. And yet, I can't help but to keep coming back to the film, to its almost dogmatic dedication to its own themes, to its beating black heart. For an audience craving a relatively mature genre film grounded by a great actor who has been too used to slumming it for the last few years, A Walk Among the Tombstones will be a breath of fresh air - if you can get past a few of its slimier aspects. A Walk Among the Tombstones is currently available to purchase on Amazon Instant Video, and it will be out on DVD & Blu-Ray on Tuesday, January 13th. Written and directed by Scott Frank, A Walk Among the Tombstones stars Liam Neeson, Brian Bradley, and Dan Stevens.